As disgusting as it is, once you get your foot in the door you're entitled to all the protections of the Charter. So, it doesn't really matter whether you don't belong here, came in illegally, or committed numerous crimes including terrorism while here. You're golden and upon request will be given millions of Canadians tax payer dollars all because we didn't live up to our charter obligations and let you stay illegally, commit acts of terrorism or other sundry criminal activities. 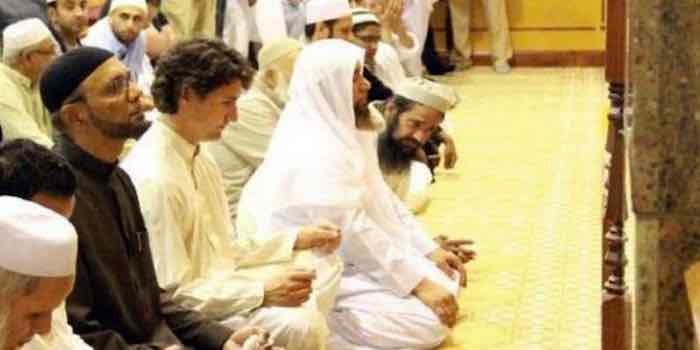 Besides our Muslim loving Prime Minister Trudeau won't bother to fight and will just hand 34 million dollars of Tax Payer money to another terrorist..
Actually Our idiot Boy has ALREADY ADDED FOR INFLATION!!!!!!!!!!!!!!!!!!!!!!!!!!!!!!!!!!!!!!!!! !!!!!!!! Three other suspected Jihadist jerks SPLIT $37 million dollars about a year after the Khadr Krap came to light!!!!!!!!!!!!!!!!!!!!!!! And the other 3 never got landed immigrant status in Canada and never went to Gitmo prison either!!!!!!!!!!!!!!!!!!!!!!!!!!!!!!!!!!!!!! Although - to their credit- dubious as it may seem- they never fought in Afghanistan and never got caught with an bombs either!!!!!!!!!!!! Are they smarter than Omar????????????????????? LIE-berals dont know and dont care!!!!!!!!!!!!!!!!!!!!!!!!!!!!!!!!!!!!!!!! Psssst, hey stupid, this started in '99 under Chretien. So he comes under a false visa, claims refugee status and then is instantly investigated and claimed to be terrorist associated under terms that would later be illegal. The entire family's life was put on hold due to this, though no fault of his or his family but the Government. But he wasn't a legal citizen. Suing the country you want to go to as a refugee is not a good way to make nice. But neither was the BS he and his were put through. I know not many have empathy here so there's no need to ask the "what would you do" question. Personally yes, he and his should be compensated for the BS they went through. That amount though, heII no. IF he was permitted in as a refugee originally and was paid a (generous, let's assume he got a good job) 55K a year for his employment somewhere, after 23 years he'd have 1.3 million roughly in wages. So he's missed out on that. Even so, let's say 8 million for the BS for the family, that gives them all one million each for their 'suffering'. And round up because inflation or somesuch. So 10 mil. Unlike Khadr (whole other story kthnx), 10 does not seem like much at all when you considering everything. But almost 38 mil? No. Even for the family he has that *are* citizens. Compensate them more *because* they are legitimate refugees put under duress by the very country they are citizens of, yes. But this much, hell no, and specifically this gentleman, no. With all that said, if the court could prove beyond a shadow of a doubt he was a terrorist agent or anything else he was accused of, he should get nothing. I haven't looked into the case itself but by the article above his case was refused by the court to be seen on appeal and he was released due to lack of evidence. The Government done f-ed this up big time, the onus is on them (which yes, I know it means the taxpayer) to compensate. It shouldn't *be* on us taxpayers, but it is. Canadians helping to create untold numbers of Muslim refugees doesn't matter to you either but a hangnail is a big deal to you. As disgusting as it is, once you get your foot in the door you're entitled to all the protections of the Charter. You seem to be okay with the Jewish lobby in North America having a say in how Canada should act on the international stage. Didn't you use those protections to your advantage when you sucker punched the barber because he was a Muslim and you did not want a Muslim to touch your hair? You seemed quite proud that he was found to be the one in error by the cops. Jewish living psychopaths, such as yourself, are the preferred population?? I'm thinking 'not'. Lots of people use a fake ID's to escape a nation that is hostile to them, that was cleared up upon landing. 'Operation Paperclip' saw how many SS Nazis enter North America after WWII?? 'More than a few' is the correct answer. or committed numerous crimes including terrorism while here. If there was proof the investigations would have resulted in charges being laid. When the investigation is dripped it means he was never guilty in the first place. You have no problem telling a lie so your version is promoted rather than 'just the facts'. In Court that would get you jail time so who is the local terrorist, an honest person falsely accused of wrong doing or somebody who lies several times a day over the smallest topics?? I would say you are a bigger danger to the peace and quiet of Canadians. I'll bet there is no list of the richest people to move to North America. The US gives Israel $3.6N per year for weapons development and their local enemy is Gaza. A WWI .303 should be all that is needed, even with a 'legal clip'. You're golden and upon request will be given millions of Canadians tax payer dollars all because we didn't live up to our charter obligations and let you stay illegally, commit acts of terrorism or other sundry criminal activities. Meanwhile Jewish big pharma gets to experiment on all North Americans and they create more diseases than they cure. How much is sent to Israel every year from all sources in North America?? LOTS!!! How much is sent to the World Bank every year from all nations on the Globe? Way more than LOTS!!! We give the World Bank $30B/yr to print our money. We spend how much in NATO that is in the business of creating refuges? 1996 would have been refugees from Gulf War 1 that started in 1991. Repatriation to his original country should be part of the settlement and the money can be used to clear up any 'charges' back home. He would have enough to set up a 'family business'. Sorry gerryh, you are mistaken!!!!!!!!!!!!!!!!!!!!!!!!!!!!!!!!!!!!!!!!!! !!!!!!!!!!!!!!! Our financial and immigration MESS began with PIERRE TRUDEAU!!!!!!!!!!!!!!!!!!!!!!!!!!!!!!!!!!!!!!!!!!! !!!! When Our nasty PET was elected in 1968- Cdn banks had 83 cents on deposit for every dollar they had loaned out!!!!!!!!!!!!!!!!!!!!!! When Our nasty PET left office- Cdn banks had 17 cents on deposit for every dollar they had loaned out!!!!!!!!!!!!!!!!!!!!!!!!!! Pierre Trudeau and his lunatic LIE-berals DEBAUCHED our currency and loaded up our economy with massive debts!!!!!!!!!!!!!!!!!!!!!!!!!! The LIE-berals spending DISEASE is so out of control around the planet that currently Cdn banks have about 12 cents on deposit for every dollar they have loaned out and that makes Cdn banks the most financially SOUND on the planet!!!!!!!!!!!!!!!!!!!!!!!!!!!!!!!!! The ugly reality is that we CDNS ARE STONY BROKE - by any logical definition of the word!!!!!!!!!!!!!!!!!!!!!!!!!!!!!!!!!!!! It will require multiple generations- OVER CENTURIES OF EFFORT to pay off the debts that existed BEFORE either Wynne-bag Ontari-owe LIE-berals or Our idiot Boy and his federal LIE-berals were elected and began digging us in even deeper!!!!!!!!!!!!!!!!!!!!!!!!!!!!!!!!!!!!!!!!! LIE-berals are currently exploring hither to UN- IMAGINED levels of debt and fiscal MADNESS!!!!!!!!!!!!!!!!!!!!!!!!!!!!!!!!!!!!!!! The truth is that Western Civilization has been bankrupted by LIE-berals.........and the BILLS ARE COMING DUE!!!!!!!!!!!!!!!!!!!!!!!! This is the reason for Brexit!!!!!!!!!!!!!!!!!!!!!!!!!!!!!!!!!!!!!!!!!!!! !!!! This is the reason for the Frnech Yellow Vests riots!!!!!!!!!!!!!!!!!!!!!!!!!!!!!!!!!!!!!!!!!!! This is the reason for the rise of the nationalists in various east European countries who want to regain some logical control of their economies that were so hard hit by Soviet Socialism!!!!!!!!!!!!!!!!!!!!!!!!!!!!!!!!!!!!!!!!! !! The east Europeans want to be part of the European Union but they have deep DISTRUST of the social welfare state that western LIE-berals want to IMPOSE!!!!!!!!!!!!!!!!!!!!!!!!!!!!!!!!! WE Cdns are simply THE LEAST INDEBTED of western nations!!!!!!!!!!!!!!!!!!!!!!!!!!!!!!!!!!! We have been allowed to borrow endlessly because our credit is good- thanks to all the oil and natural gas that Canada possesses!!!!!!!!!!!!!!!!!!!!!!!!! Our idiot Boy Justin is REFUSING TO SELL the oil or gas- by killing Kinder Morgan!!!!!!!!!!!!!!!!!!!!!!!!!!!!!!!!!!!!!!!!!!!! !! Our credit rating IS UNDER THREAT!!!!!!!!!!!!!!!!!!!!!!!!!!!!!!!!!!!!!! Our borrowing costs will SKYROCKET if Our idiot Boy is re-elected!!!!!!!!!!!!!!!!!!!!!!!!!!!!!!!!!!!!!!!! The idiot Boy wants to KILL the industry that has been producing the REVENUE that was allowing us to BORROW!!!!!!!!!!!!!!!!!!!!!!!!!!!!!!!!!!!!!!!!!!!! !!! if the idiot Boy succeeds in killing the Cdn oil patch as he has told us he intends to -then economic CHAOS WILL REIGN in Canada!!!!!!!!!!!!!!! Ant the local Jew hater weighs in with a totally irrelivent and indeciferable comment. The first mistake the government made was in not giving this fake refugee the boot as soon as it was discovered his Visa was fake. The cost should be covered by the politicians and bureaucraps that allowed this to happen. NOT the taxpayer. The only hangnail is you.
. . . and anybody else from any of the lesser races' . . . . So you'd be okay with paying out more than the 10.5 for the case? Awesome; I on the other hand am glad it was only that much, thanks to the settlement. The "settlement" would have been quite a bit LESS if only it had not been handled by LIE-berals!!!!!!!!!!!!!!!!!!!!!!!!!!!!!!!! Omar Khadr was an enemy combatant!!!!!!!!!!!!!!!!!!!!!!!!!!!!!!!!!!!!!!! Omar is a traitor to Canada - since he fought against Cdns!!!!!!!!!!!!!!!!!!!!!!! And such people as Omar are traditionally HANGED!!!!!!!!!!!!!!!!!!!!!!!!!!!!!!! It is the DELIBERATELY TWISTED LIE-beral interpretation of various laws that allows LIE-berals to insult Cdns and encourage radical Muslim Terrorists by offering blood money to Khadr!!!!!!!!!!!!!!!!!!!!!!!!!!!!!!!!!!!!!!!!!!! The Khadr Krap is morally indefensible to ordinary Cdns!!!!!!!!!!!!!!!!!!!!!!!!!!!!!!!!!!!!!!!!!!!!!! We accept that he should be classed as a child soldier. WE blame LIE-beral Jean Chretien ands his rotten immigration mess for allowing CONVICTED bomb maker papa Khadr into Canada. Why LIE-berals would accept such an immigrant is a riddle wrapped in insanity! Omar Khadr is a Cdn by accident- thanks to INSANE LIE-berals who let his vile father immigrate here for no good reason. Papa Khadr trained his three Cdn born sons into fine little Jihadists and it is HIS responsibility that one son was killed, the second crippled for life and the third- is Omar. There is NO blame to be put on Cdns for the fact that papa Khadr chose to sneak his sons out of Canada to go fight in Afghanistan. A parent is responsible for his own children and may take them on trips if he wishes- especially if mother approves- and we KNOW Momma Khadr approved of her sons fighting because SHE TOLD US SO in media interviews! It was United States army that shot Omar Khadr and took him prisoner and jailed him at Gitmo prison- NO Cdns involved- other than a couple of Csis agents that spent a couple of days asking him questions about any activities he might know related directly to Cdn issues. Yankees are entitled to deal with their prisoners in such fashion as they deem necessary. I do believe it was unwise of Yankees to treat Jihadists as “enemy combatants” rather than more humanely and honestly as prisoners of war. But we Cdns have no influence over that and should not be condemned for ignoring the fate of some Jihadist creep who should never have been allowed ANY association with Canada in the first place. Cdns are disgusted with the radical Khadr family and are enraged that LIE-berals are trying to tell us we must accept them as full Cdns. This rage is fueled by LIE-beral refusal to take away Cdn citizenship from CONVICTED Toronto 18 terror group members who DO HAVE dual citizenship. Omar Khadr was born here thanks to LIE-beral insanity so we have no place else to ship him. But people who have dual citizenship CAN legally be sent away if they make trouble- but LIE-berals take pride in refusing to use such a LOGICAL legal tools! WE Cdns also deplore the free and easy way LIE-berals let just any fool pick up Cdn citizenship-a MUCH LONGER probation and trial period is needed before a person can fully become Cdn! Cdns generally think Omar Khadr should shut up and be grateful that Yankees did not let him die on that far away battlefield-as they probably SHOULD HAVE DONE! It would make all our lives easier if he had died! Cdns also think Omar Khadr should shut up and be grateful that he is allowed to roam freely in Canada and is not rotting in a Cdn jail because he fought against us and our allies and the bombs he made certainly killed and wounded Yankees and they may also have been used against Cdns. LIE-berals do not understand that Omar Khadr with his $10 million dollar settlement and his family with their publicly expressed HATRED of all western values are walking, talking, sneering INDICTMENTS of a RANGE of VILE LIE-beral values! That LIE-beral chose to pay Omar Khadr ANYTHING ought to be regarded as a political career killing act of stupidity that defines any supporter of the deal as being way too biased, ignorant and selfish to be elected to any position in future! The cost should be covered by the politicians and bureaucrats that allowed this to happen. NOT the taxpayer. So what you are telling us taxslave is that we NEED to DESTROY Our idiot Boy Justin and his loser LIE-berals in the coming October election!!!!!!!!!!!!!!!!!!!!!!!!!!!!!!!!!!!!!!!!!! !!!!! After all it is Our idiot Boy and his LIE-beral who are sponsoring all this radical Muslim and immigration CRAP!!!!!!!!!!!!!!!!!!!!!!!!!!!!!!!!!!!! And what of former LIE-beral cabinet minister Muslim Maryam Monseff??????????????????????? Her parents LIED when they brought her here as a little girl!!!!!!!!!!!!!!!!!!!!!!!!!!!!!!!!!!!!!!!!!!!!!! !!!!! They CLAIMED they were from Afghanistan- apparently because they figured it would be more politically acceptable in Canada!!!!!!!! THEY HID AND LIED ABOUT their Iranian birth for fear of not being allowed into Canada!!!!!!!!!!!!!!!!!!!!!!!!!!!!!!!!!!!!! LIE-berls have DELIBERATELY created an immigration system that favours people from third world pest holes!!!!!!!!!!!!!!!!! And LIE-berals have messed up our immigration system ONLY TO MAKE IT EASIER TO BUY IMMIGRANT VOTES!!!!!!!!!!!!!!!!!!!!!!!! LIE-berals know very well that the majority of immigrants they are selecting will NOT be able to succeed or survive in Canada with out major govt aid for decades to come!!!!!!!!!!!!!!!!!!!!!!!!!!!!!!!!!!!!!! LIE-berals rae PUSHING ASIDE CDN BORN CITIZENS in favour of illegals and hopeless radical screwups!!!!!!!!!!!!!!!!!!!!!!!!!!!!!! Our idiot Boy even told us "he prefers immigrants who CHOSE to come here over Cdns who were merely born here"!!!!!!!!!!!!!!!!!!!! LIE-berals are using a poisoned and perverted immigration system to sponsor massive political vandalism in Canada!!!!!!!!!!!!!!!!!! The only race you're in is with the Special Olympics. You are just an intellectual punching bag MHz, a toy mouse for a cat. Maybe it is time for the Jews to join the real world and admit they aren't the master race when God isn't helping you. Invest in Israel Bonds 2.9% return..